Provides links to streaming video collections that Purdue patrons can access. Ambrose Video has exclusive streaming rights for BBC Shakespeare productions. KANOPY provides access to a wide variety of titles across genres. Once you are at the streaming page, click the appropriate "tab" (near the top of the page) for the individual vendor desired, and then click on the vendor's logo to connect. 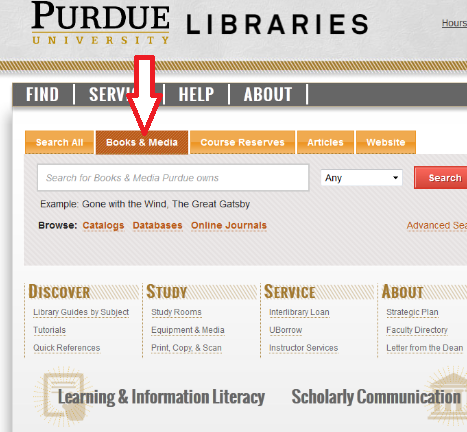 To find media titles available from the Purdue Libraries, visit the Purdue Libraries home page at http://www.lib.purdue.edu/ and then click on the "Books & Media" tab. Individual items may be searched by keyword (default), movie title, etc. The "Find in Print" link will display location and call number for media. The media collection is housed on the second floor of the Humanities, Social Science and Education Library (HSSE) in Stewart Center. The loan period for physical media items is one week.